Fashion inspiration is everywhere we look. Just go hang around a dance club in the Bronx, that funky beauty shop in Queens, the West Indian Day Parade in Brooklyn or a music festival like Coachella, and you'll get more style ideas in one hour than after five years of reading every fashion magazine in existence. We thought it would be fun to examine different unlikely spots where the seeds of fashion are planted with this new regular feature, "Better Than Fashion." The next time you are in Brooklyn, for example, swing by the Hello Beautiful Salon in Williamsburg (218 Bedford Ave.) and ask for a manicure by Naomi Yasuda, who will rock your world -- not to mention your fingertips. A Japanese native, Yasuda finds her inspiration everywhere -- from the local McDonald's to a Chanel suit. 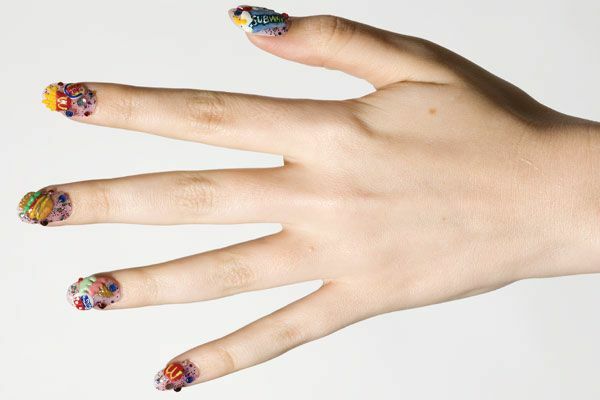 She began experimenting with nail art while still in junior high. "I did my friends' and family's nails and soon I realized I was good at it," she says. As is the case with many style crazes, nail art experimentation has found a comfortable home in the anything-goes fashion petrie dish that is Japanese culture. "Nails are very popular in Japan," she says. And Yasuda is very popular in America these days. Everyone from Alicia Keys and Fantasia to Amanda Lepore and Lady Gaga have come to Yasuda to get their nails did. She's gotten used to her clients' crazy custom requests, which have included putting eyeballs on each fingertip and painting one person's dog from multiple angles. For this piece, Yasuda designed three nail looks: a classic Chanel motif; another with a jaunty red-white-and-blue nautical theme; and finally, one featuring the eye-popping logos of fast-food joints like Domino's and McDonald's, with some burgers and fries thrown into the mix. We'll take that to go!